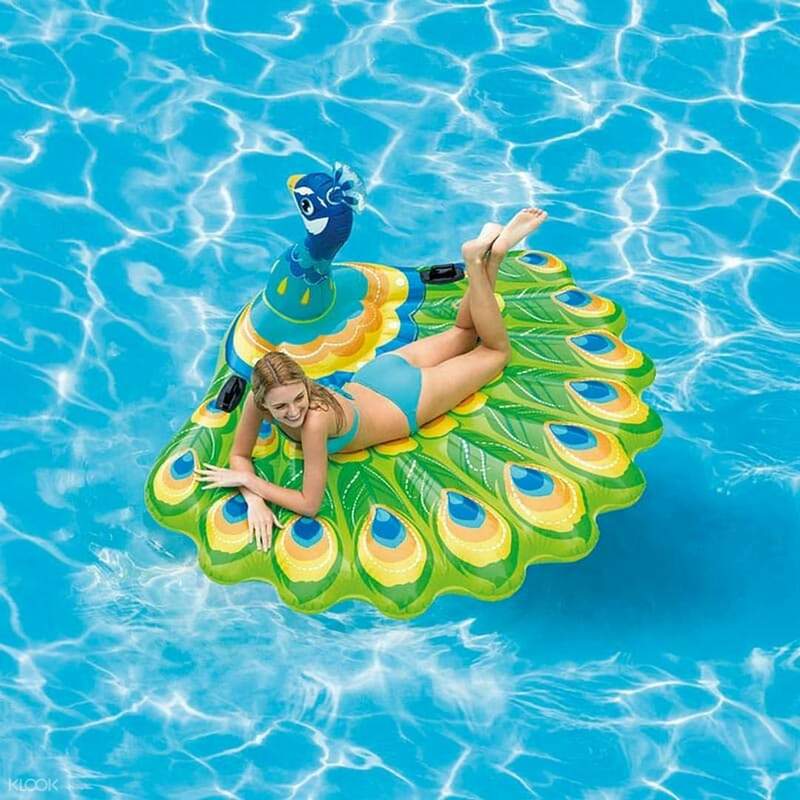 Make full use of your private villa or resort pool with fun floats! Rent the perfect props for your holiday photos or just lay back and relax under the sun! well received, delivery was on time and item had been set up. 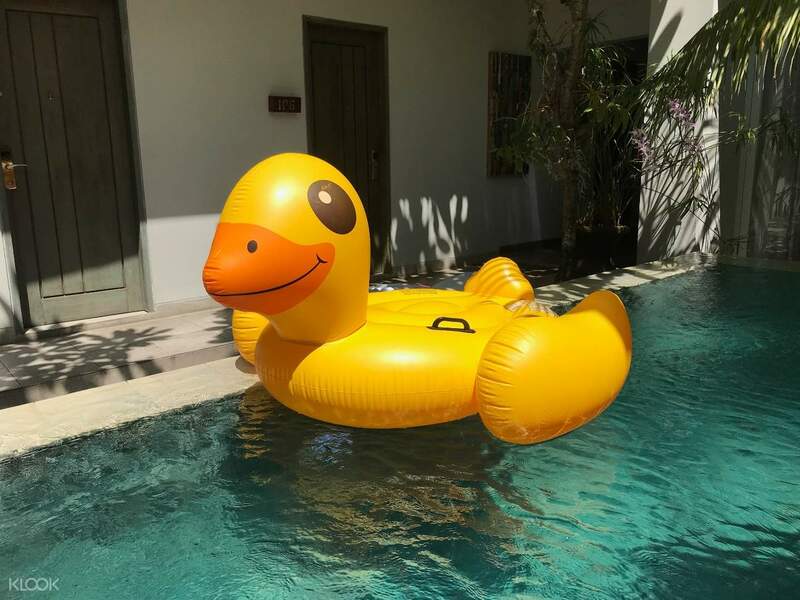 Gear up for the summer and rent the quirkiest pool props - perfect for you to lay on, or to take photos with! 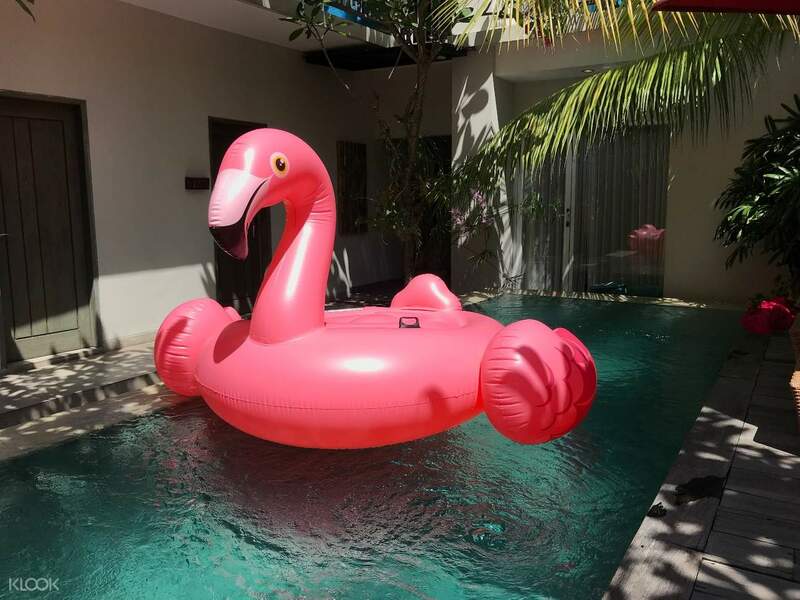 Choose from varuiys options, such as the White Swan, Pink Flamingo, Gold Dragon, Pool Bed, and more - depending on your preferences and get it delivered right to your accommodations in Kuta, Legian, Denpasar, Seminyak, Kerobokan, Canggu, Umalas, and Sanur. The floaters even come free with inflation and deflation services so you don't need to do it yourself. Just lay back, relax and enjoy your summer by the pool. 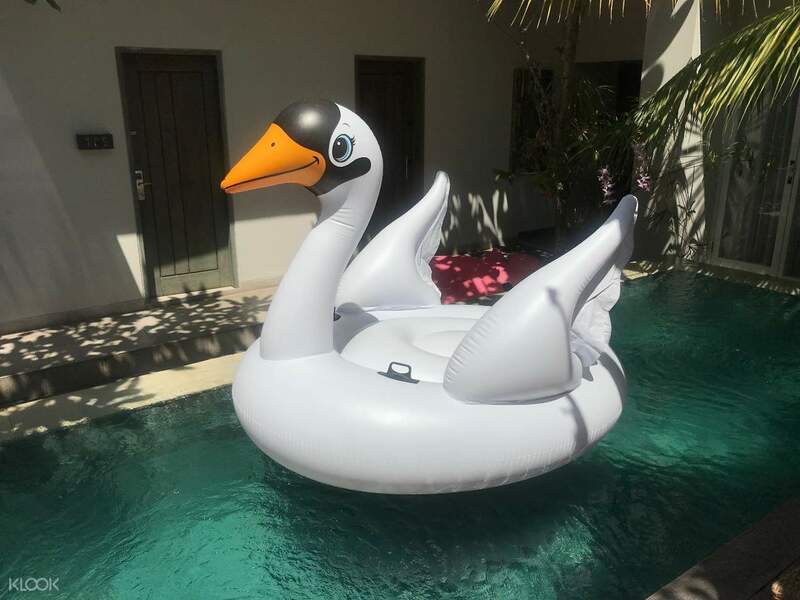 Who wouldn't want to rent a classic swan float? From booking to conformation is super easy and the rates is very good.Klook deliver the pool float as per our suggested time.My kids have a blast in the pool with their new company,Ms Rainbow Unicorn.Collect of the float also was easy and fast. 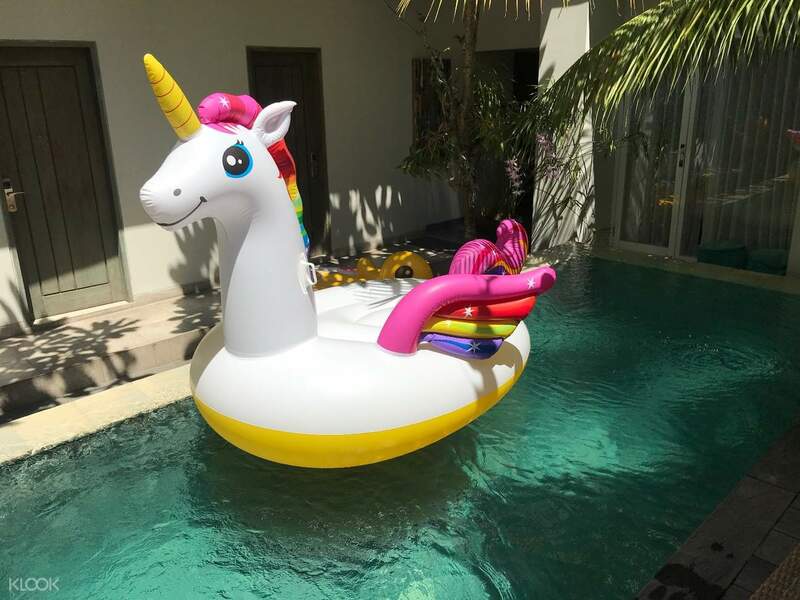 From booking to conformation is super easy and the rates is very good.Klook deliver the pool float as per our suggested time.My kids have a blast in the pool with their new company,Ms Rainbow Unicorn.Collect of the float also was easy and fast. Delivery and pick up was prompt. After float was delivered, we found that it had a small hole and air was leaking from it. Contacted them and they made arrangements to fix problem immediately. Delivery and pick up was prompt. After float was delivered, we found that it had a small hole and air was leaking from it. Contacted them and they made arrangements to fix problem immediately. My son enjoyed it. Private pool villas in Bali are usually deep, and these inflatables make swimming more fun. The service is excellent as well, reachable via what's app and deliver and pick up on time. My son enjoyed it. Private pool villas in Bali are usually deep, and these inflatables make swimming more fun. The service is excellent as well, reachable via what's app and deliver and pick up on time. 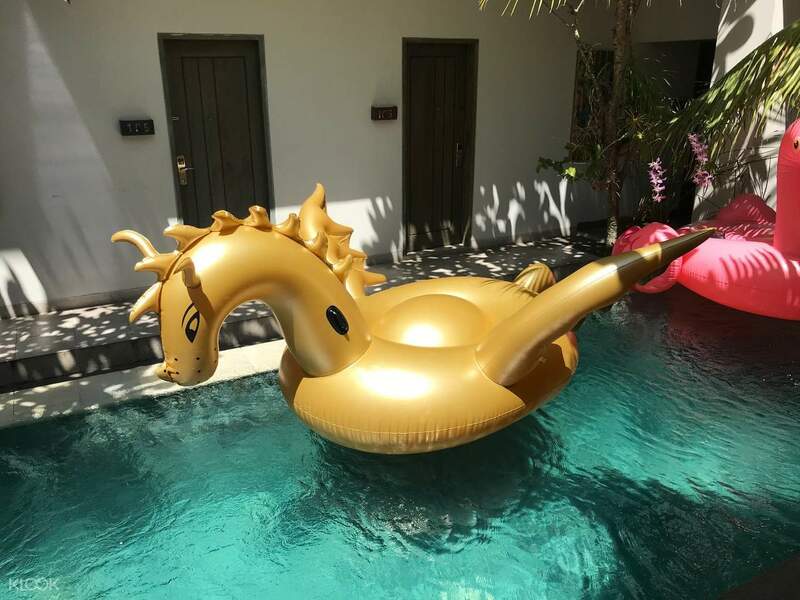 This oversized unicorn pool float is the perfect summer go-to item. 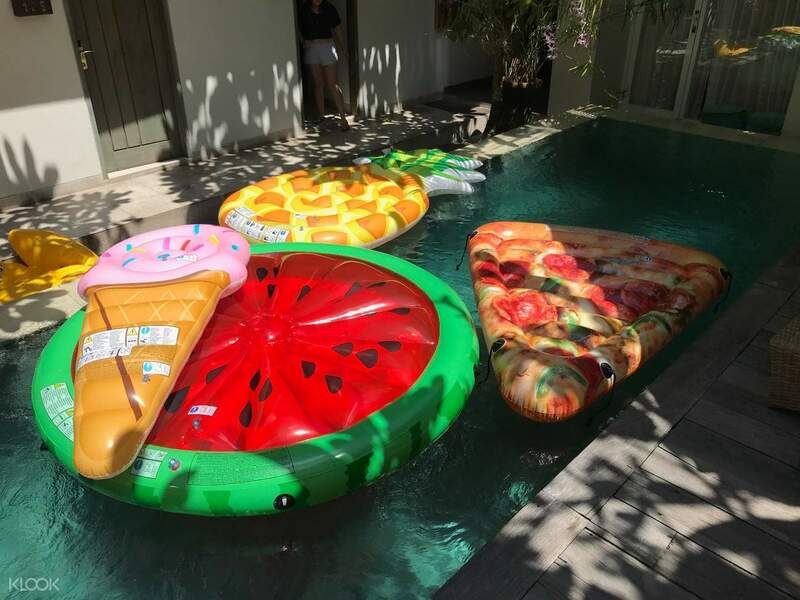 this inflatable float is the perfect choice for just about everyone. the material used to make this float is thick. Making for the ultimate photo op, this float will make for some excellent Instagram photos. Featuring a tan enhancing white color love this product!! This oversized unicorn pool float is the perfect summer go-to item. this inflatable float is the perfect choice for just about everyone. the material used to make this float is thick. Making for the ultimate photo op, this float will make for some excellent Instagram photos. Featuring a tan enhancing white color love this product!! One friendly staff texted us prior to coming by the villa and dropped off the floatie on the dot. We almost wasn't able to return it as the staff was late and we had to leave the villa already. Luckily he made it in time. Required to leave a refundable deposit. We had many beautiful Instagram photos with it, it was a total 'animal abuse'! One friendly staff texted us prior to coming by the villa and dropped off the floatie on the dot. We almost wasn't able to return it as the staff was late and we had to leave the villa already. Luckily he made it in time. Required to leave a refundable deposit. We had many beautiful Instagram photos with it, it was a total 'animal abuse'! The watermelon pool float was good enough for two adults. The Klook staff was very helpful to follow up with delivery. We had wonderful time playing pool float. It’s a good combination with floating breakfast, make the photo so so colorful. Highly recommend for those going to have pool holiday’s people. The watermelon pool float was good enough for two adults. The Klook staff was very helpful to follow up with delivery. We had wonderful time playing pool float. It’s a good combination with floating breakfast, make the photo so so colorful. Highly recommend for those going to have pool holiday’s people. We had to change the float delivery timing a few times due to unforeseen circumstances but klook personnel was very friendly. Float was inflated and deflated fast without any fuss. The person who sent the float was really friendly too. We had to change the float delivery timing a few times due to unforeseen circumstances but klook personnel was very friendly. Float was inflated and deflated fast without any fuss. The person who sent the float was really friendly too. Great price! the staff was on time for both the delivery and pick up. Our hotel was located in Ubud area, therefore an extra delivery fee of IDR30,000 was required. Still worth it! Great price! the staff was on time for both the delivery and pick up. Our hotel was located in Ubud area, therefore an extra delivery fee of IDR30,000 was required. Still worth it! On the day of delivery,the driver was 1/2 an hour late in delivering the float, however he was very apologetic and was quick in inflating the float. However, in less than 2hrs of rental, the float deflated about 30%. In the end, i realised there was a hole and text the person from the float rental company. No reply was received until 4hours later when the driver was waiting outside the villa with a new float for replacement. Brand new float which looked so much cleaner than the first one. On the day of collection, driver was late again so i would recommend to arrange delivery/collection time scheduled at least 1/2 hour in advance to prevent your plans from being disrupted. Also, i think with all float, expect it to be slightly deflated after a couple of days. Overall pleasant experience. On the day of delivery,the driver was 1/2 an hour late in delivering the float, however he was very apologetic and was quick in inflating the float. However, in less than 2hrs of rental, the float deflated about 30%. In the end, i realised there was a hole and text the person from the float rental company. No reply was received until 4hours later when the driver was waiting outside the villa with a new float for replacement. Brand new float which looked so much cleaner than the first one. On the day of collection, driver was late again so i would recommend to arrange delivery/collection time scheduled at least 1/2 hour in advance to prevent your plans from being disrupted. Also, i think with all float, expect it to be slightly deflated after a couple of days. Overall pleasant experience.